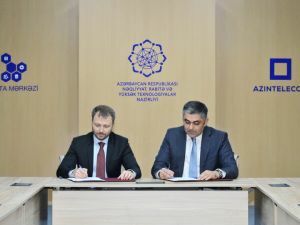 The Transport, Communications and High Technologies Ministry of Azerbaijan signed a memorandum of understanding with Cisco, the ministry said on March 15. Under the agreement, the most advanced technical solutions of Cisco will be applied in the formation of new postal services, in intelligent transport management, in ensuring cybersecurity and in development of broadband services. In addition, Cisco will also engage in increasing the human resources capacity in the IT sector, the ministry said. During the signing ceremony, the sides discussed creating a digital infrastructure, strengthening of cadastral capacity and introducing business innovations in the social and economic sphere. The abovementioned three strategic directions contribute to speeding up the digitalization process, raising public awareness in this area, reducing costs and creating new sources of income. A joint working group is planned to be created to expand the use of digital technologies and the application of new technological solutions. bakutel celebrates its 25th anniversary!